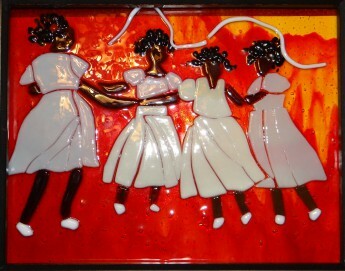 I fell in love with glass as a medium for art from my first mosaic class. From there, I began making mosaics and eventually took a fused glass class and realized that my chosen medium had a more fluid nature to it. I hope you enjoy my art as much as I enjoy making it. It reminds me that we are not perfect but each of us with our own uniqueness makes the world a more exciting place to live in.